So for about the last month, I’ve been incorporating green smoothies into my morning routine. Not only are they actually absolutely delicious, they make you feel amazing! I can say without a doubt that my skin has never looked better. My energy levels are sky high in the mornings (much to the dismay and confusion of some of my coworker’s). Now, those of your already on board with green smoothies, get excited! 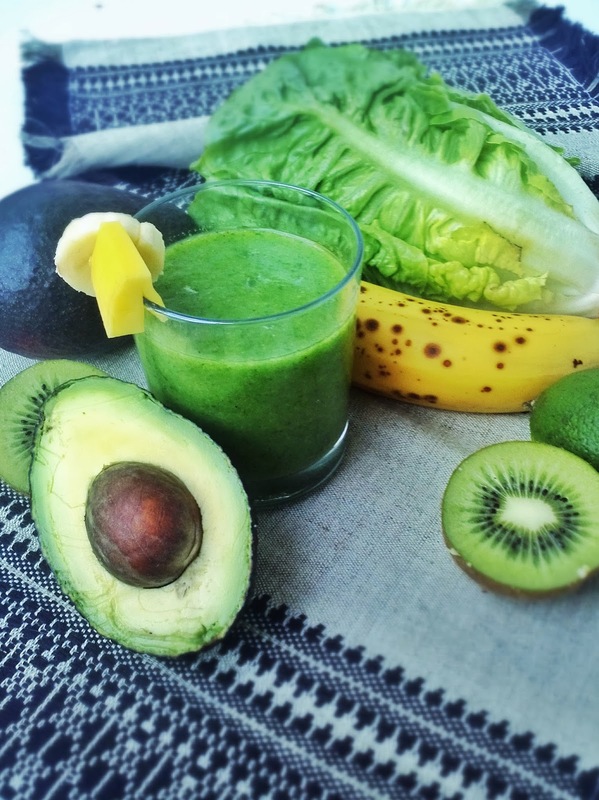 This recipe is a tropical take on how to get your greens in a glass. But I know there are some of you for whom the very idea of downing a green drink first thing in the morning has your stomach turning and face squinched in disgust. All I can say is, give it a try! Look at the pros and cons: What’s the worst that could happen? You absolutely hate it and pour it down the drain. Bummer, but that’s maybe two bucks wasted. The best? You find yourself actually enjoying something that is FANTASTIC for you! You feel amazing, your skin glows and you have tons of energy. At least that was my thinking when I first tried them out. I got hooked after watching Kimberly Snyder make her Glowing Green Smoothie (YouTube link here). One look at her shiny hair and radiant skin and you want to be doing whatever it is she is doing. Clearly it is working! Spinach and romaine lettuce – The list is long my friends. It’s high in fiber, vitamin K and A, rich in cancer-fighting antioxidants (like lutein) that neutralize free radicals; it’s anti-inflammatory and it helps regulate blood sugar and strengthen bones. And the list goes on. Click here for more. Avocado– It’s not only creamy and delicious, it’s a super food! Along with omega 3’s that boost brain function and cardiovascular health, they are a great source of potassium (more than twice as much as a banana! ), vitamin C, B-vitamins and folic acid. Their fiber keeps you full, helps you absorb more nutrients while digesting. Lime juice – Helps your liver flush out toxins, gets your digestive system moving (diuretic) and gives you a dose of vitamin C.
Kiwi – This little sucker has more vitamin C than an orange! Helps strengthen your immune system, promotes cell repair (better skin), and helps us deal with stress better! Banana – A dose of potassium and B-vitamins! To keep your energy up and muscles moving. Mango – Contains cancer-fighting antioxidants like quercetin, isoquercitrin, astragalin, fisetin, gallic acid and methylgallat. High in fiber. A good source of potassium, vitamin-B6, and vitamin A, C and E.
Water – Hydration. You just spent 7-8 hours not drinking anything. Give your body some liquids! · On a budget? Buy frozen spinach! So, so much cheaper and it keep for ages. · New to green smoothies? Start with more fruit and less greens. Slowly add more. Like many good things in life (beer, wine), you may find it’s an acquired taste. But one totally WORTH acquiring! · Still too grassy? Citrus cuts that flavor. Add more lime or lemon juice and fresh orange, grapefruit or tangerines to help balance the taste. caffeine with a ton of antioxidants. Combine all ingredients in a blender and blend until smooth. Add more water if the drink is too thick. If ingredients are sticking too the sides, turn off blender and use a wooden spoon to push them down toward the blades. Decorate the glass with a slice of fresh fruit! Let me know! I really feel like mine is brighter, smoother and more even. And now that it is kale season, I'm throwing that in my smoothies as well. I'll have to get a new smoothie recipe up for it!